Craft fair in mid October. Fairly successful but felt like mid DECEMBER. All of the Etsy Artists were amazing! It was great to meet everyone who i have been email and featuring in my treasuries. There is so much talent on the (newnew)team! 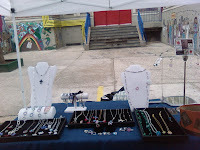 My display table is pictured above. Upcoming giveaway on Tiger Lily's Blog along with a review. More to come on that. Recently got back from Florida which was amazing/bizzare/frustrating/very important. I took a trip down to Worth Avenue and saw some very ritzy stores including Cartier, Michael Kors, and, of course, Tiffany's. It's basically a tropical madison avenue. Anyway, I got to talking to one of the Ladies who works at a boutique right on the strip and she really liked my stuff and asked me to send line sheets. I may not be as upscale as they would like, but I am going to try anyway! Lets cross out fingers. I've made lots of boutique contacts and have not been able to follow up on any of them! It is really getting to be crunch time for the upcoming holiday season. I really need to get crackin! Wish me luck! !